Tokyo market opens at midnight and close at 9am. As you can see there is some gaps at different time of the day, and since major market is traded in United State Dollar and Europe Euro and Great Britain Pound. The least hour trading which does not have any open market to push the price is during 10 pm and 8am. Since the opening of Tokyo Japan Yen and Sydney Aussie is midnight and 1am, it will have very little effect on major currency. I trade scalping and breakout during this 2 hours and on EUR and USD related currency pair. For scalping, I using get 5 to 10 pips profit at very short interval of 15 minutes or less. My trade setup would be taking the moving average of last 3 hours and predict the next 3 hours the price go up or comes down. Many trades are highly successful and small profits can be achieve using a 30 or 50 stoploss strategy. I use breakout strategy if I do not have a distinct trend to trade the scalping above. By looking at the 3 hour chart (at 15 minutes interval bar), I would establish a support and resistance line, either converging or diverging. At midnight, it no price crosses either support nor resistance line, I will place a Buy stop and Sell limit at +10 pips and -10 pips for resistance and support level. With 10 pips profit and 30 pips stop loss. The reason is the momentum is building up in the currency if it is not trending for last 4 hours. This is visually true before the opening of London and New York market. My personal favourite is Europe Euro / United States Dollar (EUR/USD), Europe Euro / Great Britain Pound (EUR/GBP) and Great Britain Pound / United States Dollar (GBPUSD). There is many other more currency pairs major and cross which I will scan the chart for available trade setup but most of the time I would go for the above mention 3 currency pairs. Another important trade setup I used to execute is to check the 24 hours chart at midnight to see the yesterday trend of the currency. If am trading scalping and the daily bar is open and close towards my trending direction, it double confirm my trades. And for resistance and support, I will look at the thickness of the open and close bar. The difference between the support and resistance have to be more then the daily bar thickness, then is a double confirm for me to trade the Buy and sell Order. (with +10 pips and -10 pips respectively). Of course once either trade trigger, you have to cancel the other one. If reach 1am and none of the 2 trade is triggered, please cancel both. Wait and see until the next 11pm. Don’t worry if you miss the time to trade scalping or support and resistance, as you will always have another change the next day and every other normal trading days. Make more from today's Forex market with How to Make a Living Trading Foreign Exchange. Foreign exchange is the most traded instrument in the world. It's not hard to understand why. Nobody needs to buy stocks, but because of today's extensive global trade we must all deal directly or indirectly with the forex world. Yet, while trading foreign exchange is one of the most exciting and potentially lucrative activities in the world, about 90 percent of traders lose money. 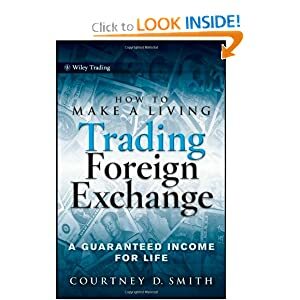 In How to Make a Living Trading Foreign Exchange, Courtney D. Smith provides a concrete and comprehensive approach to becoming a profitable forex trader. Smith first explains all the basic information you need to know to get started in trading forex. He then introduces the tested, profitable techniques that will help you make money in the forex market, offering a variety of different methods to use over different time horizons—from those that look at the market from the perspective of days and weeks to those that hold positions for less than one day. Smith describes, for instance, a system that monitors the market from three different time perspectives and doesn't enter the market until all three are calling for an entry into the market. Throughout the book, the author stresses the two most important aspects of trading: risk management and trader psychology. How to Make a Living Trading Foreign Exchange shows how to take risk management one step beyond and use it as an offensive weapon for enhancing profits. And perhaps, most important, it tells how to overcome the biggest block against making money in the markets: your own psychology. Whether you're a novice or a pro, says Smith, following the techniques in this book will turn forex trading into your ticket to financial freedom. Courtney D. Smith is Chairman of the Investment Mentoring Institute, an organization devoted to building great investors. He is also President and CIO of Courtney Smith & Co., Inc., which manages money for institutions, family offices, and high-net-worth individuals. Mr. Smith is the owner and Editor in Chief of Commodity Trading Consumer Research (CTCR)—the premier tracking service for the futures industry—and author of six books, including Option Strategies (Wiley). He has made more than 1,000 TV appearances on shows such as Wall Street Journal Report, Moneyline, and other programs on CNBC, Fox News, Bloomberg, and CNN.